I have the urge to pick at an old wound: the notion that there might be a better HDTV than Pioneer's now-age-old KURO plasmas. I can feel the negative tweets and the outraged forum posts being written already, as the enthusiast AV crowd tend to cling to past technologies like really cool, broken-in t-shirts. You know what? At some point that t-shirt is going to wear out and you are going to need something new. Thankfully, despite constant conjecture that the company will exit the plasma market, Panasonic has been inspired to make a new product, the new ZT Series. • Read more HDTV reviews from HomeTheaterReview.com's writers. • See more reviews in our Blu-ray Player Review section. • Explore more sources in our Media Server Review section. LED-based LCD TVs have lots of advantages - including lower-than-average power consumption, a slim form factor, and bright whites - but they simply don't make the inky blacks that we see today from a top-performing plasma, nor do they have the screen uniformity found on a plasma set. 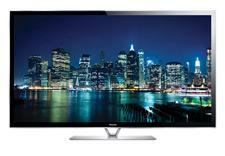 Simply put, right now plasma HDTVs perform better in moderate to dark rooms when compared with the best LED/LCD HDTVs. If you are going to go plasma, Panasonic has three levels for you consider: the entry-level ST Series, the formerly top-of-the-line VT Series, and the absolute top-of-the-line ZT Series. The 2013 models have all gotten significantly better in terms of performance. Adrienne Maxwell and other reviewers have suggested that the entry-level ST60 bests 2012's VT plasma offerings. With a calibrated 60-inch Panasonic ST60 in my master bedroom, I can vouch for its performance. Combine the performance with its $1,500 asking price, and the ST60 is a downright five-star steal. The Panasonic TC-P65ZT60 is designed for a different customer: the extremist who wants the best video image that money can buy right now. 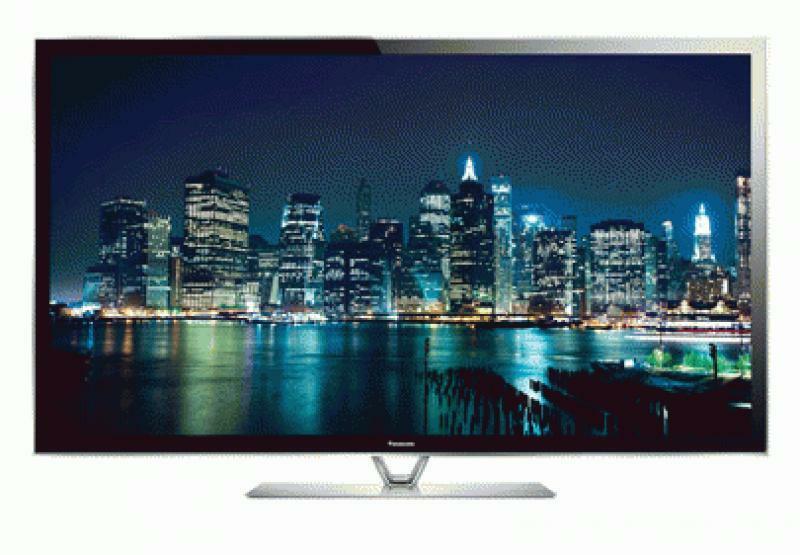 The Panasonic TC-P65ZT60 is a $4,010, 65-inch 1080p HDTV that's loaded with features. This plasma is not LED-thin, but it's pretty svelte compared with other plasmas on the market today. The "glass" is all one piece with no raised bezel, which makes for a seamless viewing experience. There is a silver accent around the outside of the set that visually makes the TC-P65ZT60 look a little more stunning on the wall, but it also draws your eye away from the image at some level. The TC-P65ZT60 comes with two remotes. One is the standard IR TV remote that is rectangular in shape and not bad ergonomically. 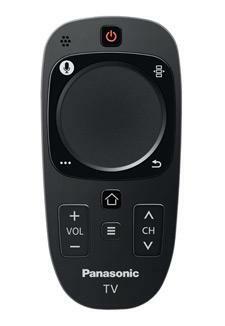 Panasonic also offers a smaller, simpler Bluetooth-based Touchpad Controller that includes a wheel-like controller for navigation. You can speak into this remote like Siri on your Apple iPhone to control TV functions, but I didn't find this function to be all that useful, especially since I couldn't use it to control any of my sources, including DirecTV's Genie. It's a neat idea, but not one that I could make do anything meaningful for me in my user experience. The TC-P65ZT60 uses what the company calls its "Studio Master Panel," which is its best glass made today. Panasonic has removed the air layer between the panel and the front glass and has worked extensively to reduce external light reflections and improve bright-room performance, which is one of the standard knocks on plasma HDTVs. During mid-day hours, the sun just pours into my current room, and the TC-P65ZT60 can keep up nicely in many ways, just as well as a 70-inch Sharp edge-lit LED did during its brief stint in my living room while waiting for the ZT. Plasmas get a lot of love for their deep, rich blacks, and the Panasonic TC-P65ZT60 deserves kudos in that department, but the company has also made some pretty significant improvements in the color department - a topic that is quite hot in the world of Ultra HD these days. Before you pop for a UHD set, know that the ZT Series offers 30,720 gradation steps with 98 percent of DCI color space. This is pretty damn strong for a 1080p HDTV. 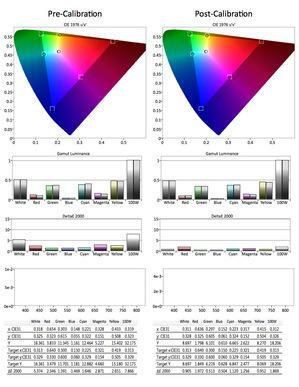 Additionally, Panasonic claims better color purity out of the red phosphor in the ZT Series. The colors on the set, especially when professionally calibrated, were not Vegas over-the-top saturated, but offered a more subtle level of excellence, especially in background images and other fine details. We'll get into that more in the Performance section. 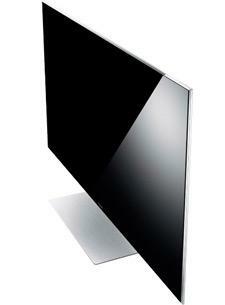 The TC-P65ZT60 is an active 3D HDTV, as you might expect. Panasonic went so far as to make sure that the set meets all current THX video standards in terms of both 2D and 3D standards for brightness, sharpness, color reproduction, and gamma. This means the image will look very good without much adjustment required. Realistically, though, if you are spending $4,010 on this type of set, you are paying a significant premium to get the nth degree of performance from your HDTV investment. Anything less than an ISF or THX calibration, complete with a top light meter by a highly trained professional, seems like a bit of a waste. The TC-P65ZT60 is a full-featured HDTV, with all of the smart TV applications that you'd expect. Unlike my Sharp and a recent Vizio that I had in my house, the Panasonic rocks CinemaNow, which is important for me, as my wife works for CinemaNow's parent company and I therefore have a free subscription. This provides me with lots of content; for those who buy their sets via Best Buy or Magnolia, it's likely the best of the streaming services. Don't worry if you want to use other apps like Netflix, Amazon Instant Video, and VUDU - they are here, too. Streaming content isn't what I choose to use to evaluate a top-performing plasma; however, if you want to dial in a quirky movie like Jiro Dreams of Sushi (a documentary about a Michelin three-star sushi joint located in a subway station in Tokyo), it's just perfect. Panasonic allows you to get into all sorts of customization for Twitter, Facebook, the Weather Channel, Skype, and much more. The TC-P65ZT60 has built-in WiFi. While my current system has my Internet router right in my Middle Atlantic equipment rack, providing a strong WiFi signal, I would still recommend a hardwired connection for best performance. In our pending new home, we will run hardwired Internet to every HDTV location, so that we can take advantage of features like the TC-P65ZT60's ability to access LAN (local area network) devices. If you have home movies, your music collection, and/or other media stored on a small, fast hard drive somewhere in your home and connected to your network, the TC-P65ZT60 can access them via DLNA. Additionally, make sure you have an ARC (audio return channel) setup for your AV rig, so that you can send audio from the TV to your receiver or AV preamp. Consider the TC-P65ZT60 to be a source, as well as a display. David Abrams from AVICAL was hired to come in and calibrate both the TC-P65ZT60 and the TC-P60ST60 in my master bedroom. He used Calman software and a $19,000 light meter for his work, and the results were pretty eye-opening. Overall, the TC-P65ZT60 didn't need crazy work in the calibration department; neither the grayscale nor the color points were too far off the mark in the Cinema picture mode. 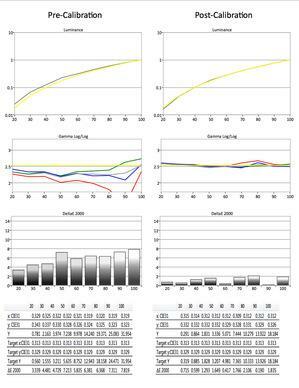 Still, there were benefits to be gained from Dave's calibration of an ISF Night Mode, eking the various parameters even closer to reference standards. For those who would like to see the numbers, we've included the pre- and post-calibration results. Click on the images to the right to enlarge them. To my eyes, the overall image looked much more coherent when Dave was done. Colors were subtler, and blacks were a little deeper than the already-deep black that you get out of the box. If there was ever an HDTV that you would spend the money to haveprofessionally calibrated, it would be the TC-P65ZT60 - not because it comes jacked out of the box, but because the reason you buy the ZT over the ST or, more specifically, the VT Series is that you want the best 1080p HDTV image that money can buy. You need the real-deal-Holyfield calibration to get that level of performance from any top HDTV that you are going to buy. Not even those $20,000-plus Ultra HD sets come "right" out of the box today. Read about the performance of the Panasonic TC-P65ZT60 on Page 2.